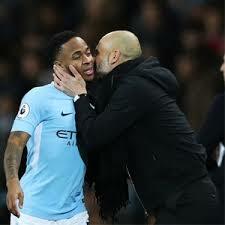 Sterling double takes Manchester City top once more – Royal Times of Nigeria. 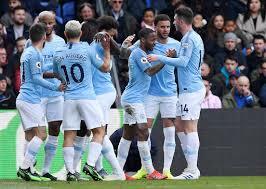 Raheem Sterling scored twice for Manchester City in Sunday’s 3-1 win away at Crystal Palace in a Premier League clash. The win has moved Manchester City back above Liverpool – at least temporarily before Liverpool’s clash against Chelsea at Anfield later on Sunday. Gabriel Jesus secured the third goal for Manchester City in injury time after Luka Milivojevic had halved the deficit with nine minutes remaining. The game was Manchester City’s ninth straight win in the EPL. Sterling scored after 15 minutes after he clipped the ball over Vicente Guiata and into the roof of the net from a tight angle. He then made it 2-0 with 18 minutes of the second half gone; Silva did well to claim Sergio Aguero’s chip into the box and laid the ball back for Sane. The midfielder squared low from the left edge of the area and Sterling guided his left-foot shot inside the post to double his side’s lead. Palace pulled a goal back in the 81st minute when Milivojevic he struck a brilliant free-kick, but Jesus made sure of the points for City in injury time with a calm finish from close range. Crystal Palace are away to Arsenal at the Emirates in their next game, while Manchester City returns home for two dates with Spurs in a four-day span.